Rogue’s Echo Pulling Blocks are designed to transform any stack of standard Olympic bumper plates into a more stable, fully adjustable platform for the targeted training of individual barbell movements. 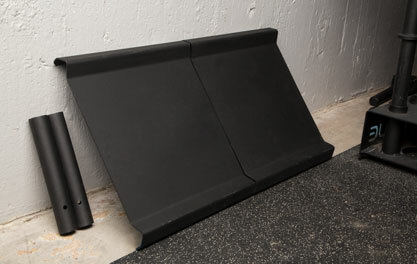 A great cost-efficient and space-efficient option for any gym, this unique system includes (2) laser-cut steel loading pans, (2) 6” support pipes, and (2) 12” support pipes. Athletes have often utilized stacks of plates as a simple, affordable alternative to full-scale, heavyweight pulling blocks. The problem with this method was two-fold: less surface area on which to drop the bar, and less control of where the bar might bounce/roll after the drop. The Echo pan-and-pipe system—based on a concept first brought to us by an inventive Rogue customer named Adam Walsh—addresses both of these issues and re-invents the economy pulling block in the process. 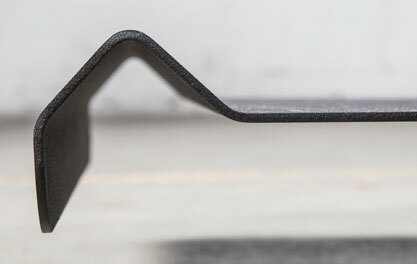 With any height setup, Rogue recommends that the loading pan is flush with the top of the stack of plates and IS NOT floating above the plates due to the support pipe hitting the floor. This could potentially damage the pans and also the floor. Users are also encouraged to lift exclusively with bumper plates, as steel plates can damage the finish or dent the blocks on a drop. Echo Pulling Blocks are designed to sit on top of a stack of standard Oly bumper plates. Utilizing the included sets of support pipes and the strong foundation of the plates themselves, the system’s 18” x 15.5” steel pans offer a locked-in platform with ample surface area. Each pan also features a bent lip design to prevent the weight from potentially rolling off after a drop. Bumper plate stacks have been popular DIY pulling blocks for years, thanks to their durability and precision measurements—allowing for quick and exact height adjustments. Adam Walsh recognized this benefit and designed 6” and 12” support pipes (1.875” in diameter) that can be swapped out with a quick release spring button. No Support Pipe - Designed for pull heights ranging from 3.5" - 6"
6" Support Pipe - Designed for pull heights ranging from 6" - 12"
12" Support Pipe - Designed for pull heights ranging from 12" - 18"
Our pulling blocks are made in the USA from 1/8" thick laser cut and formed steel, strong enough to handle any drop without damaging the plates above or below them. 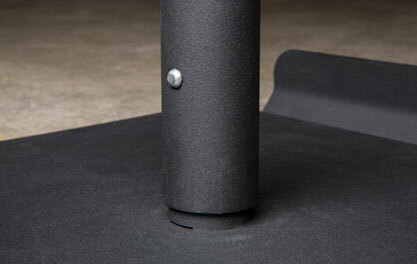 * The steel pans feature an 18" wide x 15.5" loading area (per block) and are finished in our texture black powder coat. 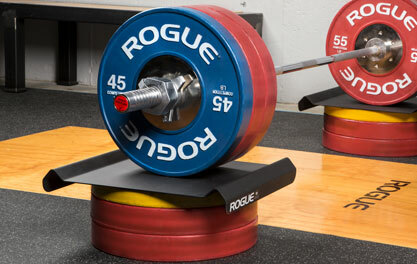 *Important: Rogue does NOT recommend using the Echo Pulling Blocks when lifting with steel plates, as they may damage the finish or dent the tops of the pans when dropped on them. 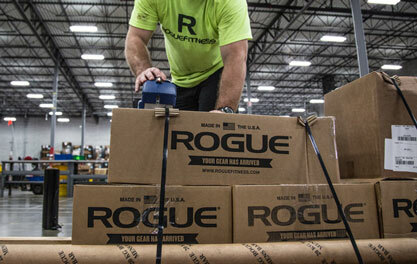 Echo Pulling Blocks are just one of many Rogue products that can help Oly lifters with technique, safety, and rehab work. 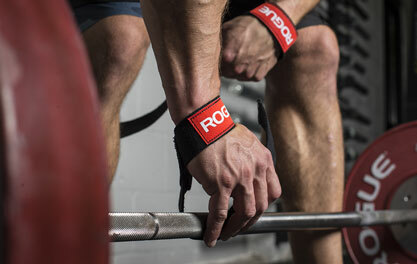 Customers interested in a more traditional set-up can also check out Rogue’s Metal Pulling Blocks and/or our range of leather and nylon lifting straps..
Another major benefit of Echo Pulling Blocks is the ease of storage. Lightweight and portable, the steel blocks and support pipes can go with you from one gym to another, offering an easy set-up and an equally simple post-workout take-down. Compared to full-size pulling blocks, the Echo system can fit onto a shelf or in a tight corner, ready for its next use. Rogue Echo Pulling Block Set is rated 4.5 out of 5 by 2. Rated 5 out of 5 by Smitty083 from Great economical solution for multi height blocks! I am very happy with this product. Solid good area surface, easily adjustable to differing heights. I needed to buy a couple extra bumpers to provide the base for the blocks and still have the weights I needed for the bar, but that was much more economical than other solutions. Being a garage lifter, I also love it that these take up very little space when not in use. Rated 4 out of 5 by Thor8 from Great and practical block set I have used this set the last weeks. Easy to adjust height and it ensures that the bar is stable.